My new Personal Best, my first ribbon(yay! ), and my first 7+ score! Thanks everyone for the wonderful comments and all of the kind votes! So, yeah, this is 100% natural, the coyote had just caught this duck when I spotted it from several hundred yards away, running through the brush, so I managed to position myself in front of a clearing, and it passed directly in front of me with the prize in it's mouth.. I knew immediately that I had an excellent shot! 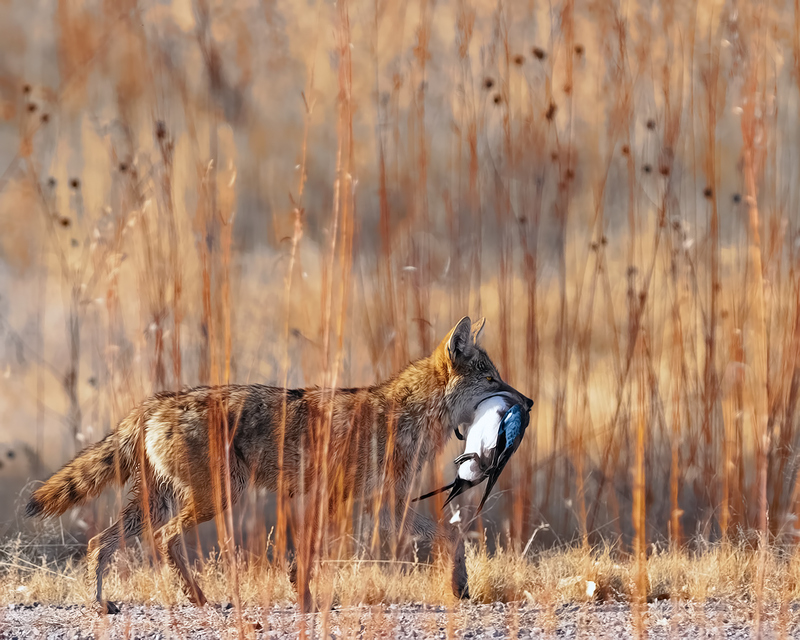 I'd like to share a couple of other really nice images that I captured on this trip to the refuge..
<-Same coyote, enjoying his meal while sandhill cranes watch. Stunning picture! One of my favourites on DPC. It took me way too long to get a chance to comment on this shot. It is truly incredible -- one of the best shots on DPC. Period! I like this far better than the advanced editing shot because of the weeds. They add to much to have them blurred that much. You really should submit this to national geographic's -- your shot. I think it stands an excellent chance of making it into the magazine. What an incredible take on the challenge - IMHO one of the best shots this year. Brilliant work. Excellent image Cory, congrats on the ribbon. Absolutely a stunning image, worthy of the cover of Nat Geographic! I think this image celebrates life and is one of the best images on the DPC. Congratulations on your ribbon, and beautiful shot. Congrats on your new PB! Great shot Cory. Cory, warm congrats on the ribbon and your new personal best. Fantastic capture...congrats on your first ribbon!! I keep coming back to this. I'm in awe of the focus and detail in what should be focused and detailed, while the surrounding reeds and brush are just blurry, tone-filled ambiance. It's really an amazing shot. I'd wager the vast majority of photographers would have gotten their AF hung up the foreground brush. Sniper. And the detail in the fur is also incredible. Hell of a lens you've got there. Cory!!! Huge congrats on your first ribbon! (and in Canada, red is first place, blue second...so technically, up here, you won ;-) Great capture, talk about timing eh? just awesome, Cory! Congrats on all counts. Cory- you did it! PB score! Congratulations on that and the red ribbon. Top shot all the way. Wooooooo your first ribbon! a very very well deserved one at that! well done! You don't even own a 300mm f/2.8 IS lens! Way to go, Cory, congrats on the first of many ribbons! Way to go! Great image for your first ribbon. The voters got it right~~~ Hurray. Congrats on your new PB. Awesome shot. You had quite a good day in the field that day. Congrats on your ribbon man. What a great shot. Marvellous nature shot, with great light and drama along with excellent technicals. In this challenge though, it was just begging for the title "Circle of Life". ;-) Congrats on the ribbon ... well deserved. Well done Cory, great shot! Congrats on the ribbon, the new PB and a 7. Awesome shot. Well deserved trifecta. Congrats on a killer (no pun intended) image, Cory. And on your first (I'm sure of many more) ribbon. Congrats! Great catch! Or are they fed? Colors are marvelous. I love the lines ... and the life in this photo. Congrats, certainly well captured, both of you. Congratulations on your PB and first ribbon. 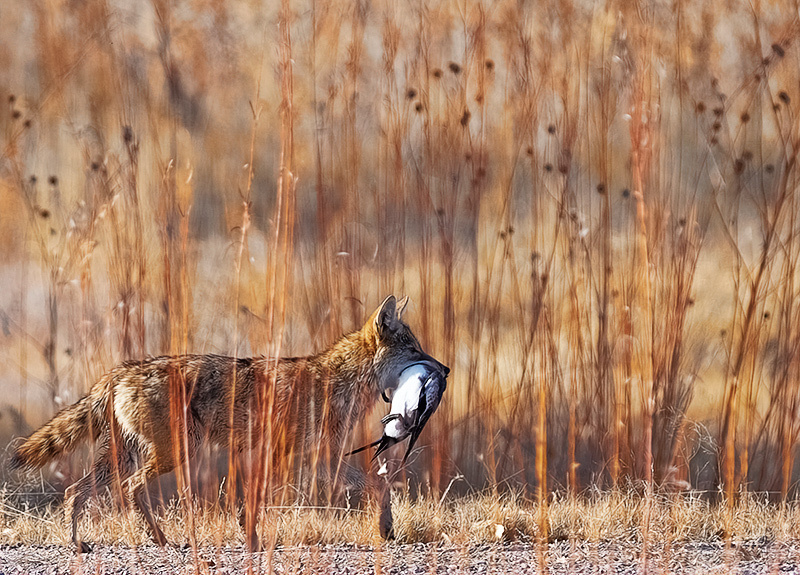 Lovely light on the coyote, and the oof grasses provide a great backdrop. Yee haw! Cory got a ribbon! WTG, dude! Great work. Well done on your first ribbon! Congrats on your first ribbon and your personal best. Congrats on your new personal best! Well done! While I scored your entry with a "9", I would have given the "Marsh Hawk" a "10". I truly admire your wildlife photography. Congrats on your first ribbon. It's such a pretty color. I love RED. See, dude, I told you a ribbon wasn't far away for you! Nice going! This could ribbon, and deserves to. Oh this is fabulous. I love the dry grasses as vertical lines. Terrific focus. Superb image with excellent composition. Nice capture; the soft dof of field really brings out the coyote. Good job. The clarity in the main subject adds to the sense of the dramas, and cycles of life. The background bokeh creates a stunning effect topping off a well captured and ribbon winning entry IMO. My equal top pick of the challenge. The composition and the bokeh from the tall grass is what makes this shot for me. 10. A winner for me. Love it. One of my favorite images in this challenge. It's my kind of wildlife shot. You nailed the focus on subject in a tough focusing environment. Well done. Incredible capture. Great job with focusing. The reeds on in front of and behind him are perfectly blurred. WOW this belongs in a Free Study totaly awesome!!! Proudly hosted by Sargasso Networks. Current Server Time: 04/20/2019 08:45:18 PM EDT.